The Argent Estoile (O.A.E.) may be bestowed for excellence in the Arts or Sciences in specific areas of endeavor. Know ye that even as the muse inspires Our best artists, so it is that ______ inspires us all with skill, talent, and devotion in the field of ______. We the Crown Trimaris thus name you as a Companion of the Order of the Argent Estoile Trimaris, on this __ day of ___, A.S._____. There are those whose gifts inspire us all, whose skill and devotion move us to admiration. It is known to Us, the Crown Trimaris, that Our subject ______ has shown these qualities in the field of ______. We are pleased therefore to welcome you as a Companion of the Order of the Argent Estoile Trimaris, on this ____ day of _______, A.S. ______. Artisans who share their talent and enthusiasm in the field of ________ deserve to be acclaimed for those qualities. Thus it shall be that upon this ___ day of ____, A.S. ____, _______ is acknowledged to all as a Companion of the Order of the Argent Estoile Trimaris, by the Crown Trimaris. Accomplishment in the Arts and the Sciences supplies the polish which gives luster to our society. For outstanding skill in the field of ______ know that, We, the Crown Trimaris, do name _______ as a Companion of the Trimarian Argent Estoile. Done this _____ day of _____, A.S. Even as the muse inspires all artists, so have you _______ inspired us with your skill, talent, and devotion in the field of _________. 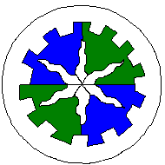 As the Crown Trimaris, We are committed to honor the devotion of Our artisans, and thus name you a Companion of the Trimarian Argent Estoile this ___ day of ___, A.S.
Quarterly azure and vert, an estoile a bordure embattled argent.